Major’s Hill Park is Ottawa’s oldest park, formally established in 1875, and covering just over five hectares in the heart of the capital. A large lawn forms the centre of the park. Many of the walkways surrounding the lawn offer views out over the Rideau Canal and the Ottawa River. 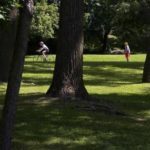 Between events, the park is a calm oasis in downtown Ottawa, and the perfect spot to take a break between visits to the ByWard Market and nearby museums and galleries. This park features some of the best lookouts in Ottawa, offering stunning views of the Ottawa Locks on the Rideau Canal, the Ottawa River and the Parliament Buildings. Take a stroll through the park’s stately trees, over its rolling lawns and winding pathways, and learn about its history through a series of interpretation panels.